I know on the About page it says that I became a tarot reader after a year of mentorship in 2009 and have been doing professional readings ever since at fairs, festivals, and one on one with clients. The thing is, the back story behind how I got into professional tarot reading is far more complicated, messy, and weirdly synchronistic than that. I suppose before I tell it like it is, I should share that I never really considered myself much of a psychic or reader. I have had a few experiences in my life that were supernatural but I am also from a region of the south and a background in church that believes in guardian angel visitation, loved ones coming to you with messages from heaven, speaking in tongues, and possession of the holy spirit. In my mind, whatever mystical experiences I had growing up weren't because of any abilities on my part but an outside force acting upon me. As a teenager I developed a great interest in divination as part of witch craft. I tried different methods from bibliomancy, tarot, pendulums, and even scrying. The only thing I seemed to have any knack at in the beginning was scrying with a black bowl of water. I had one experience where my spirit guide at the time showed up, and loomed over me in a way that my dear friend I was reading for felt her presence and my reading became more of an instance of channeling. Again, I chalked it up to an outside force having an effect on me, not any ability of my own to read. I also didn't want to read for others again because I didn't want to scare my friends. During my teen years, I went back and forth on my studies of witchcraft and magick because I was raised within a Christian belief system and I felt the inner conflict of doing something so against the beliefs that my family had and that were initially ingrained in me. I ended up going to a Christian college and, ironically, it was there that I made the decision to pursue my studies in witchcraft with conviction that what I was doing was right for me. During this time, in 2008, I met the love of my life, Damon, who was a practicing occultist, and his friends who were of like-mind. One of his acquaintances was June Wright, the co-owner of Unique Treasures in Johnson City, TN and resident tarot reader. Unique Treasures was on Main Street and was part cafe, part antique shop, and part place of business for tarot readings and witchy meet-ups. The food was basic and the furnishings were shabby-chic with the business motto, "if it's not nailed down, its for sale." I think even a few things that were nailed down were for sale, to be honest. The owners of Unique Treasures, June and Brandy, were eclectic, for lack of a better word. June was an older woman with long hair the color blonde that easily hides gray. She wore clothes that varied from last-season fashion magazine to hippie/gypsy depending on her mood. I remember she always had a few rings on her fingers and her nails were always painted. Brandy on the other hand, was a curvy woman with dyed red hair, metal band t-shirts, and a brusque manner. She seemed more fit to run a bar than a antique shop and I had guessed right in this assumption for it wasn't long after I met the two that Brandy left the business and the town for higher prospects. At the time I met June, I had some turmoil in my life. I was going to a college that I didn't feel I fit into, studying a major I wasn't going to do anything with (I had already decided teaching just wasn't for me at least in the grade school aspect), and I was bumping heads with my family who thought I was slacking off when I was actually struggling hard in figuring out what to do with myself and my future. June saw my struggles, like a strange female Virgil watching Dante slump around in the dark gates, and offered me my first professional tarot reading. Damon agreed that I should get one and paid for it himself. I have to admit, I was super nervous about getting a tarot reading from a professional. Sure I had read my own cards and had my cards read by my friends who studied the craft but it was always in a giggling, amateur setting like our locked bedrooms or the cafeteria. June's tarot room was a nook in her cafe, a shop that once was a business front and housed gangsters in the 20's and 30's. The nook sat cozily under an iron spiral stair case and against the tiny service elevator that was said to be how the gangsters made cash deals from the safety of the apartment above. 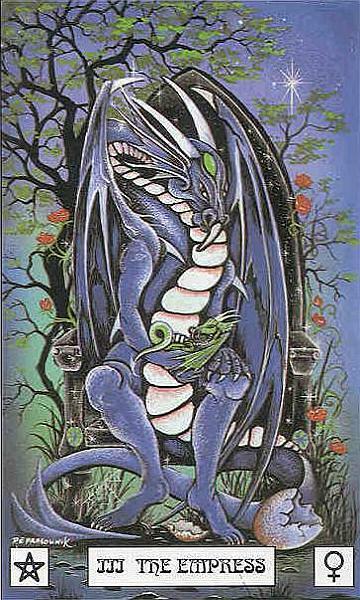 The decor of the nook was mostly sheer cloths in purples, pinks, and blacks, draped on all sides and fairy images. 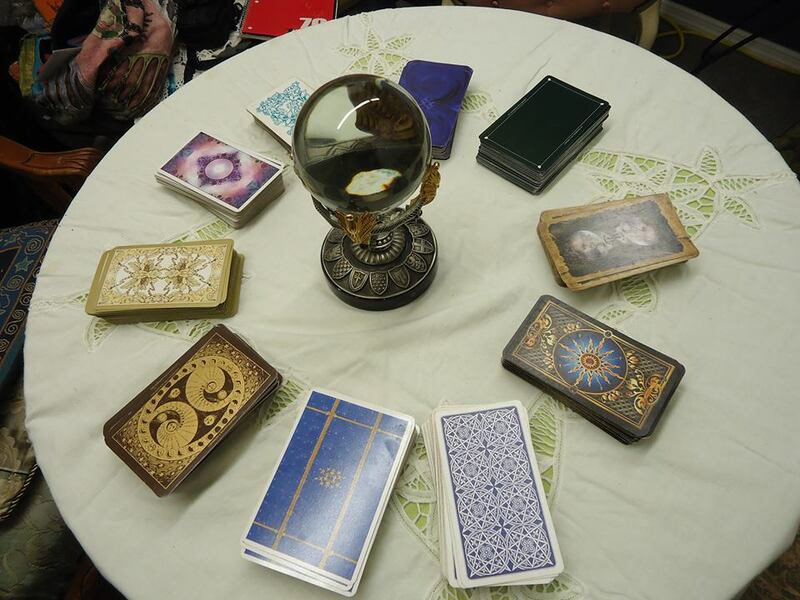 In the center was an antique, round table set with more scarves, a glass crystal ball, and a selection of tarot decks. Two chairs sat off the table sides and a bench in the corner for when the reading was for more than one person. It was a very small space and it smelled like airy incense. June was no more than a foot or so away from me, close enough to smell her perfume, as she told me to pick a deck for my reading. I don't remember what deck I chose, but I do know now it was an offshoot of the Rider-Wait and that the images were fairy-like and medieval. I'm not even sure if I saw it again I would recognize it. I only remember these small details because all of June's decks were like this. The spread was a simple celtic cross, but in June's interpretation. The first card was the significator - who I am right now sitting before her. It was a card of struggle. She laid out more cards, pointing out my love of learning but that I'm currently in a position where I don't know what to do with what I have learned. She showed me the barriers within my family having an effect on how I view myself. Then she put a card above the significator and it was the High Priestess. I remember the card depicting a young woman with brown hair and a serene face, holding a book. I thought in that moment, "I'd like to be like that." June was quiet, which was strange because up to that point, each card seemed to trigger an immediate response from her. She looked at the card, looked at me, then back to the card. After a while June told me I had a strong intuitive ability and that I should harness this and be reading the cards myself. I told her that I had dabbled in divination but I didn't think I had any aptitude for it. She ignored this and went on with my reading. My ally was the Magician and my enemy card was The Empress - I remember her saying that Damon would give me strength to do what I needed to do - and he did, he gave me strength to step out of the life that I didn't want or resonate with and into the path where I could be myself, the path I am now on. 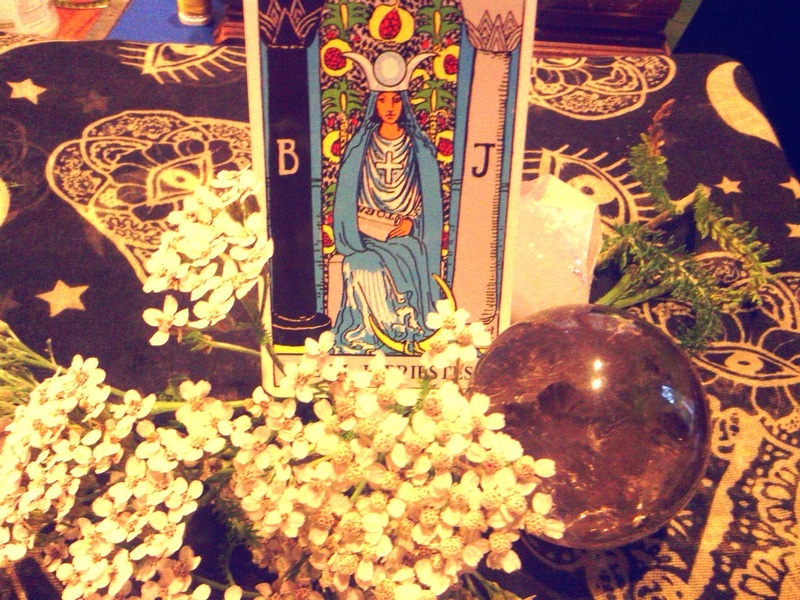 After the tarot reading was over, June went back to that High Priestess card, pointing at it with a long, manicured nail. She told me again, I should be reading as I would be very strong at it. It was then and there that she offered to teach me and take me under her wing as her tarot apprentice. I worked with June on and off for a year. I not only learned tarot from her but I also learned how to make espresso-based drinks, how to set up a display in her windows, and how to talk to customers who were skeptics. My very first solo-reading was three months after I began my training. 2 young ladies came in and wanted tarot readings. June explained that I was her apprentice and obtained their permission to let me sit in on their readings. After June finished with the first young lady, June asked the second if she would be willing to let me read for her instead. The client agreed and I felt a million butterflies go through me as I shuffled the cards. Up until then I had only read for June, Damon, and a few friends as practice. As I prepared for the reading, the girl explained that she would love some insight on a situation with her boyfriend. I began to lay out the cards. I remember that the Empress showed up early along with many cups. I suddenly knew, I felt it in my whole being, that this woman was pregnant. I looked at June, scared to say anything even though I felt it was imporant in the reading. June had taught me never to predict pregnancy, marriage, or death in a reading but here I was, my first time, and I wanted to do that very thing. June gave me an encouraging nod so I took a breath and looked my client over. She was tall and thin with a heart shaped face and short blonde hair. Nothing about her would say she was pregnant but I knew it was true, so I asked if she was. The girl turned pink and covered her mouth with her hands. Her friend looked confused and repeated my question. The girl nodded, explaining she had just found out and that no one else knew yet, not even her boyfriend, but that was why she wanted the tarot reading, to see how things would turn out for them. I told her the cards had good news for her and that I saw nothing that would hinder a loving relationship for her, her man, and her baby. The clients gave me a heafty tip and told June they would be back for another reading soon, with more friends. From that moment on, I was hooked. I loved tarot reading and I knew this was exactly what I needed to be doing. June set me up at the Blue Plum Festival that year and I got my first taste for the hectic, high energy of event tarot reading - a very different thing from the one-on-one readings in the quiet of her cafe nook. I learned many lessons that year as to how to talk to clients, how to deal with skepticism, even how to handle someone who was intoxicated. All of this would become necessary in my work in years to come. I didn't stay on with June after 2009. She had her own business problems regarding taxes and, later, her marriage and health issues. I won't say there weren't scuffles and hard feelings at this time, there were. Money was being dealt with under the table, the city scrounged up a tax law from the 40's and 50's that put an additional tax on fortune tellers (one of many examples of how states along the bible belt try and put out alternative spiritual businesses), and more than a few times I felt that I was not making what I was earning. June's explanation for the last was that I was still an apprentice, even when I had developed my own clients, or that she simply wasn't making the money I suspected her to be. I left the shop feeling exploited and leaving June behind to handle her own financial woes. While she and I do not talk anymore, I do honor her in memory for recognizing my abilities long before I did myself and for taking the time to train me in this remarkable craft that now allows me to touch the lives of so many. 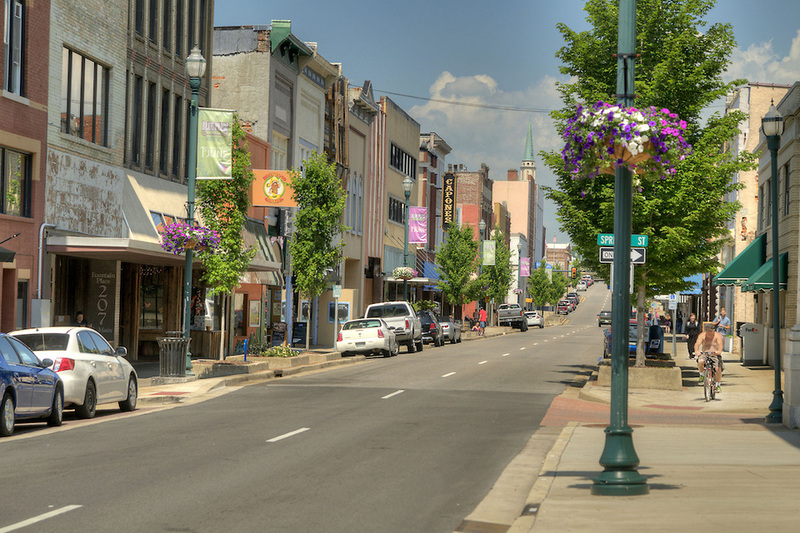 Today June runs a shop, just off of Johnson City's Main Street called Caravan Mystique. She dropped the cafe and, with the aid of her daughter and a few like-minded friends, sells antiques, space for witches and belly dancers to meet up, and tarot readings to both her long term clients and the curious people who find themselves drawn in by her gypsy feel. I share this story now with you, in hopes that you will also one day be touched by someone who will see everything that you are meant to be and help you along your path. As for tarot reading, if you are interested in having your cards read, please feel free to drop by my Tarot Readings page for one of my In-depth Reading Sesssions.